The Japanese people love festivals. There are celebrations for the change of seasons, honoring ancestors and leaders, fertility, religion, cultural heroes, and special personal events. Festivals bring family and friends together and give a reason to celebrate all the many aspects that make life interesting and meaningful. Festivals vary in different regions of the country based on local traditions and history. As there is seemingly no end to Japanese Festivals, there are many to choose from for additional study and even to reproduce in Amatsu. The Calendar of Festivals here is not all - inclusive. Many have been eliminated that pertain more to men or fertility rites. Others - though not geisha-related are included to give us a better understanding of the culture. Even the ones that are not geisha-related could be adapted for an Okiya production. So allow yourself come creative license and have fun with this assignment. The San-ga-nichi or "three days" of the New Year, is one of the most important Japanese festivals. The beginning of the New Year is the best time to make sure that good luck and happiness will follow in the days to come. Ancient rituals were designed to make this happen and many of these continue to be practiced today. There is a thorough cleaning performed in the home and all things are put into order. Throwing dried peas and beans from the open windows or paper slides (shoji) is believed to chase away evil spirits. Houses and gateposts are decorated with straw ropes which are often made to represent lucky Chinese numbers like three, five and seven. Pine tree branches are a very important decoration. They symbolize long life. When the festival is over, they are burned, but the meaning of this has long ago been lost. Sometimes there are festivals for the burning of these pine branches. The food used in the celebration includes lobsters (their bent and ancient appearance signifies long life), oranges, edible seaweeds, and mirror cakes (associated with the Sun Goddess). A series of 11 traditional bugaku dances held at the venerable Dainichi-do shrine. Though its origins are unclear, the festival is said to be associated with the restoration of the shrine in 718. Amamehagi, also known as namahage, visit the houses of young children in order to warn them not be lazy in the new year. The Joma Shinji matsuri sees participants dressed as samurai warriors shoot arrows at a 60 cm target, with the Chinese character for oni written on the back. Each successful shot drives away the devils. Thousands gather throughout the day and the night to pray for good luck and to buy daruma dolls for the coming year. The first and largest daruma festival in Japan. In the evening, visitors gather around a dying bonfire to exchange carved wooden usokae (bullfinches), hoping to end up with one of the gilt wooden carvings circulated by disguised shrine officials. The intent is to exhange 'lies for truth' since uso also means 'lie'. Maiko and geisha assemble together at the Nyokobo Academy and promise to do all they can in the coming year to improve their performance skills. Taking formal vows together is fairly common in Japanese life. It is still the year Oni wa Soto! Fuku wa Uchi! Son et Lumiere events, ice sculptures and fireworks feature at this frosty winter festival. Attractions include a giant slide made from natural ice, an endurance competition and a bobsled race. A 'bewitching winter wonderland' of snow and ice statues illuminated at night. One of the biggest snow festivals in the Tohoku region. Ceremonial parades and seven sacred noh plays mark the beginning of the new year, traditionally celebrated a month later in this area. Major bean-throwing festival held at the head temple of the Shingon Buddhist sect. Attracts top sumo wrestlers and famous entertainers every year. Three goblins dressed as grand-father, mother and child are chased by young men with torches. One of Japan's largest daruma burning festivals. At this twice-yearly festival, the shrine's thousands of stone lanterns as well as it's famous bronze hanging lanterns are all lit to magical effect. All Tenmangu shrines are associated with bulls and at this major shrine festival, local business donate many cow-related prizes made from gold, copper and silver. Top prize though is live bull that the winner has to look after until the autumn. Ice sculptures and illuminations as well as winter sports. 2-4 February: Japanese families celebrate this festival by tossing beans out the windows to keep evil spirits outside (soto) and invite good fortune inside (uchi). The maiko and geisha celebrate by entertaining in bizarre costumes. This is like a carnival time. Cross-dressing, alcohol, big party. Local winter festival featuring snow and ice sculptures, fireworks and 100 torch-bearing skiers forming a night time procession down the slopes. A nightly aurora borealis-inspired laser light and music show illuminates the drift ice and the crashing waves of the Okhotsk Sea. for visitors to cook fish bought at the market. Oysters usually sell out by the afternoon. Annual kite market dating back to the Edo Period (1603-1867) when kites were said to 'cut the wind' and thus stop fires from spreading. Though formally known as the O-tauesai, or rice-planting festival, this is also a celebration of fertility. Hiroshima is famous for its oysters and throughout February, oyster festivals are held in Hiroshima city, Miyajima Island and fishing towns along the coast where you can sample a range of oyster and fresh fish dishes. A parade of hundreds in festival dress led by horses with colourful headgear and saddles. Horses and people alike dance mambo-fashion while thousands look on. Men dressed as oni (demons) act wildly and prod people's backs with burnt out torches. This is said to expel evil spirits and townspeople bend over to receive the demons' blessing until late at night. The largest of Hokkaido's winter snow and ice festivals. Teams from all over the world come to build snow statues for the International Snow Statue Contest held during the festival. New Buddhist sect (established 1978) Agon Shu's Hoshi Matsuri or "Fire Rites Festival" involves the lighting of two huge bonfires of millions of prayer sticks - gomagi and the procession of supposed relics of the historic Buddha. Hosts the world's foremost ice sculpture competition and holds the record for the largest snow statue in the world. Many sculptures and snow slides all illuminated at night. Japan's longest-running snow festival featuring many sculptures. Also showcases the work of Niigata Prefecture's renowned kimono makers. Dry grass on the slopes of the mountain is burned to signal the beginning of spring. Annual tug of war contest between the people of the 'lower' and the 'upper' towns. Thousands take part pulling on each end of a rice-straw rope over 50m in length. Yuki toro (snow lanterns) are snow sculptures in the shape of traditional Japanese ishidoro (stone lanterns). At this festival, around two hundred yuki toro and 300 miniature igloos grace Hirosaki park with the snow-covered castle in the background. Celebrates the mythical 'founding of the nation' day with a 'goddess' contest and a beard contest. The winners lead a parade of 800 people dressed as Japanese gods. Priests chant sutras and pray for peace while dousing themselves in cold water. Blending Shinto and local folk traditions, this festival starts with ceremonial kagura dances and continues with namahage dancing around a bonfire and a torchlit procession down the mountain. Local people build kamakura (snow houses) all over the town and offer food and drink to guests. For 250 years, local performers have been performing kabuki on an outdoor stage. The families of actors make up much of the audience which gives the event a festive atmosphere. Local folk dance festival that dates back when people with no experience of farming were taught how to work in the fields through dancing with a tool called an eburi (later enburi). A celebration dance first performed during the Kamakura Period (1192-1333) by victorious samurai of the Minamoto clan. Dancers wearing long, brightly-coloured plumes on their backs and beat large drums while parading in the streets. A tea party hosted by Kyoto maiko and geiko is held amongst the blossoming plum trees at Kitano Tenmangu Shrine. Traditional music is performed almost continuously on 12 stages set up in different locations to showcase talent from each part of the town but the highlight of the festival is the closing dondo-yaki ceremony at which the towns new year's decorations are burned. At only 30cm tall, the torii gate of this shrine is the smallest in Japan. It is said that women who are able to pass through the gate will deliver children safely and not suffer women's illnesses. Festival of water and fire. Priests conduct a fire ceremony every evening from 6pm, swinging long torches in the air to ward off evil. At 2am on the 13th, water is drawn from the 1200 year-old well and offered to visitors. Water is drawn from the Onyu River and presented to the principal image of the temple. Said to represent the 'sending' of water to Todai-ji temple in Nara whose well is fed by the river according to legend. A ritual dating back over 1200 years. Recreates a popular leisure pursuit of court nobles in the Heian Period (794-1192). Poets dressed in Heian-style kimono sit amongst the plum trees, composing poems on narrow strips of paper that they slip into sake cups floating by in nearby the stream. Hina Matsuri (Doll Festival), held every year on March 3, has its roots in an ancient Chinese purification ceremony in which evil was transferred to doll surrogates (katashiro) which were then cast away on a river. Hokyo-ji is often referred to as the 'Doll Temple' due to its extensive collection of dolls. Participants dress in models of dolls' clothing. Dolls are cast adrift on the river that runs through the shrine to pray for children's health. Women and young girls dedicate dolls to the shrine diety. The dolls are brought to the sea at Kada beach and cast adrift on a boat to take away the evil and sicknesses that aflict women. Annual festive market selling all kinds of Daruma dolls for good luck. Festive market to commemorate the construction of Shimabara castle. Ceramicware, plants, food and much more on offer. Ceremonial rice planting festival to mark the beginning of Spring. Features time-honoured kagura dances and bugaku court music. A chance to witness the rigorous ascetic exercises of the mountain priests of Takao-san such as walking on hot coals. Lively mikoshi parades and Shinto music and dance all day. Mikoshi parades and a procession of 700 in period dress. Gaily decorated floats parade around the city streets before being ritually burned to the accompaniment of dancing and music. Horse-back archery contests and a parade in ceremonial dress. Lion dances are performed around the city marking the end of the long winter and the Buddhist services of the equinoctial week. Taking place on the last Saturday of March, an exploration of Kirishima's beautiful flora. April, Kyo-olori and Ktano-odori: Myagawa-cho's and Kami Shichiken's annual dance performances respectively. The Kyo-odori festival features traditional folk songs and many of the local people attend. A highly-anticipated annual showcase of geiko (geisha) dances and music. A rare chance to see these skilled artists perform in public. Held once every seven years in the Year of the Tiger and Year of the Monkey (2004 was the latest) this amazing and sometimes dangerous festival takes place over the course of a month in April and May. The first part of the festival 'Yamadashi' held in early April sees the giant fir trees, weighing over 10 tons, pulled from the forest and hauled with straw ropes across freezing rivers to the town. In the second part of the festival 'Satobiki' the trees are paraded through Suwa to the local shrines: Kami-sha and Shimo-sha (upper & lower shrines). During 'Yamadashi', local men clad in happi-coats and tanked with sake ride the huge logs 'onbashira' down the steep slopes in Shimosuwa. Over the years there have been a number of deaths and the log riding is strictly reserved for locals only. The next festival will take place in Heisei 22, or 2010. Unique festival in which men dressed in women's clothes dance a lively jig on board a boat afloat in the harbour which is festooned with flags and streamers. Taiko groups play their drums and many stalls sell local produce. To mark the melting of the snows and the beginning of spring, paper or toy dolls are floated down rivers. Once popular during the Heian Period (794-1192), this tradition can now only be seen in a few places. Spring celebrations incorporating the Matsuyama Castle festival and the Dogo Hot Springs festival. Events including period dress parades, dances, noh plays and rice-throwing for longevity. An annual get together for Japan's remaining Chindon (professional 'musicians' employed to advertise new store openings). Noisy and fun. Annual parade of floats carrying centuries old, elaborately-made mechanical dolls. They perform to the sound of traditional music played on flutes and drums. Traditional dress parades featuring many women and girls in stunning kimono and full make-up accompanied by servants and attendants. Held annually on the first weekend of April. Rice planting festival accompanied by ritual song and dance. Coincides with cherry blossom season making the event all the more colourful. Held annually on the first Saturday and Sunday of April. Festival to honor Takeda Shingen, a famous warlord of the Sengoku Era and the founder of Kofu. The highlight of the festival is a parade recreating the Takeda Army with more than 1,500 local citizens dressed in authentic costume. Held every year on a Saturday in early-mid April. April 8 is celebrated as the Buddha's birthday throughout Japan with a baptism ceremony where sweet tea - amacha - is poured over a statue of Buddha. Festival dating back to a ninth century plague. Around 30 people dressed in period costume carry a decorated canopy with four "demons", when the procession stops spectators rush to get under the canopy to protect themselves from ill-health. A parade of colourful hanamikoshi (flower floats) takes place on the first day followed by an evening of streetside comedy with teams of amateur comedians wheeling props around in carts and performing wherever they find an audience. A parade of wheeled floats takes place on Sunday followed by more of the same. Held annually on the second weekend of April. Festival to coincide with the blossoming of the cherry trees on the banks of the Asano river. Traditional dances and other entertainments are held on a floating stage. A 700-year-old tradition in which participants help each other drink tea from an oversized tea cup. Held annually on the 2nd Saturday and Sunday of April as well as on the second Sunday in October. The annual festival reaches its climax after 3 days when 4 huge mikoshi are aggressively shaken by bearers in a vigorous and dramatic manner. Coincides with the blossoming of the cherry trees in the shrine precincts. Azalea festival celebrating the blossoming of approximately 35,000 azalea trees. Attracts 3 million visitors annually. Festival commemorating the establishment of a bakufu (shogunate) government at Kamakura in the late 12th century. Events including Shinto dances, yabusame and mikoshi parades take place from the second to the third Sunday in April. Widely considered to be one of the three most beautiful festivals in all Japan. Rightly famous are the majestic festival floats on which intricately controlled marionettes perform for stunned audiences. Also features gagaku & bugaku and kagura (Shinto music and dance). The festival is designated an important cultural asset by the government. Sight-seers gather outside Takayama jinja - a local government office during the Edo period. Unique festival in which children perform kabuki plays on extravagantly decorated festival floats as they are pulled around the town. Gaily decorated mikoshi representing 13 neighbouring towns are paraded around historical Nikko. Carp are released in to the Sarusaono Lake in the belief that suffering is also thrown away with the fish. One of the liveliest dance festivals in Kyushu. Incorporates elements, brought over by boat from festivals from all over Japan. It was originally thought up by fishermen who had nothing to do but sit and drink when the southern wind set in. Held on the third weekend of April. Top-ranking shogi (Japanese chess) players play games using people dressed in full traditional military garb as pieces. Held in the Maizuru Forest Park with views of Mt. Gassan in the background. Annual procession featuring women in sumptuous period kimono and full make-up. Recreates the common Edo Period (1603-1867) sight of courtesans parading the streets with their attendants. Performance of an ancient dance which first came to Okibun-ji Temple during the Nara Period (709-795 AD). This dance, said to be the origin of Japanese religious performing arts such as kagura and noh, now survives only in Oki and in the Imperial Court itself. Celebrates the blossoming of the 5,000 cherry trees in the castle grounds with traditional events during the days and illuminations at night. A thousand year old festival dedicated to the god of sake-brewing. There is a mikoshi procession and participants hold up maks of the deity on long sticks. Sailing festival with famous sailing boats representing Japan, China and Korea as well as European countries conduct manoeuvres in the harbour. Festival to mark the opening of the mountain climbing season in Kamikochi featuring ceremonies devoted to the safety of climbers and many entertainments. Traditional bullfighting event in which two bulls are pitted against each other in a test of strength. Unlike Spanish bullfighting, the animals are not wounded and are not killed. Festive floats tour the town carrying about 40 child musicians playing flutes, drums and shamisen. Starts from Hidaka Shrine at 8.30 am and continues until 9pm. All in aid of praying for safety from fire. Musical parades, ceremonies and other festive events take over the whole town throughout the period. The spectacular climax is a recreation of the famous battle of Kawanakajima which involves flintlock guns and thousands of local people dressed in period armour. The largest ceramic fair in Japan. Hundreds of stalls line both sides of the main street in Arita selling a wide variety of pottery at bargain prices. On May 5, the Japanese celebrate Tango no Sekku, or the Boys' Festival. The intention of the festival is to exemplify war-like qualities in Japanese youth. Flags are seen everywhere. Especially the carp-shaped paper flag. The wind blows through the hollow flag giving it the appearance of flying through the air. The carp represents the spirit of warfare - tenacity, purpose, perstence and courage. The message is just as the carp swims upstream against the current, so must the Japanese fight against the fierce odds and currents of adversity. This may take from mythology were a DRAGON CARP struggled long and prevailed by swimming past the great Dragon Gate rapids, lived a thousand years and finally rose into the sky. Iris leaves als adorn the roofs of the houses so that the flags made by humans and the "flags" of nature are seen together. Another popular name for this time is the FEAST of FLAGS. Boys are presented with small figures representing great heroes of the past. Ancient swords, bows and arrows, spears etc are handed down from generation to generation. Night festival of colourful floats consisting of giant, decorative paper lanterns. At around midnight, the lanterns begin to be paraded around town with local men hanging from them who start battles whenever other floats come close. Thousands gather on the approach to Nozaka Kannon Temple to enjoy puppet plays, storytelling and a range of other classical arts and festival amusements. The main event is a period dress parade on the 3rd recreating the arrival of Minamoto Yoshitsune and his entourage when he came to Hiraizumi to seek the protection of Fujiwara Hidehira. This festival features floats known as Hikiyama. Children in full make up and costume perform Kabuki plays on stages built in to these lavishly decorated three-storied festival floats. Many colourful events including recreations of a samurai era sea battle involving about 200 boats, the famous duel between Miyamoto Musashi and Sasaki Kojiro and a colourful parade of courtesans. Parades, dances and entertainments all with an international flavour. Features dragon dances, baton twirlers and decorated festival floats. Shinto ceremony, parades of warriors in full period dress, traditional music and mikoshi parades. A gathering of 31 antique dashi, (drawn festival floats). These remarkable wooden constructions are towed around town and then down to the beach where they are pulled through the shallows at low tide. Large scale festival with history going back nearly 800 years. Colourful and musical parades and events all over the downtown area city. Attracts 2 million people annually. Giant decorated kites (up to 15m in length) are flown on the banks of the dry riverbed of the Edo River. Local teams fly huge decorated kites, attempting to bring kites of other teams to the ground. Accompanied by assorted events, traditional and otherwise, including sacred dances, parades and taiko drumming. Festival for peace featuring flowers, music and a wide range of fun and entertainments. Attracts visitors from all over the world. Dozens of stalls selling kutani pottery set up in the grounds of Terai Town Hall and the Sano Kutani Museum. Many events related to kutani pottery also take place. Features a parade of three enormous dashi, (drawn festival floats) each around 20m in height and weighing around 20 tons. Known locally as dekayama (giant mountains), these floats are built entirely from wood, bamboo and rope and without the use of nails. A procession of local people, dressed in traditional costumes, visit historical spots on the route of the Shio no Michi (Salt Route), a historical road that was once an important trade route. Three days of festival music and ceremonies are held on a floating stage made from canal boats tied together with stalls and other festivities on the banks. See demonstrations of this centuries old method of fishing on specially prepared tourist boats during the period. The ageuma (rising horse) ritual involves young horseback riders in samurai armour riding horses up a steep 3m high cliff. It is traditionally believed to predict the success of the coming year's harvest. The festival also includes a procession of a boy on horseback and retainers in period costume. Play a gave of virtual yabusame! Held on the banks of the Sagami River, this is an annual event at which a giant (14m long) kite is flown by a team of nearly 100 people. Kemari, a ritual game of kick-ups played by priests in Heian Period (794-1192) robes, is played in the grounds of this famous shrine. An event held in the memory of Takehiko Kurushima, a writer of children's stories who lived in this town. Various events for children to participate in such as a festival parade and kids' sumo wrestling. Floats, wagons filled with dancers, and around 200 mikoshi are paraded through a large area of downtown Tokyo in honour of the deities of the Kanda Shrine, shinto priests on horseback accompany the parade. The main Kanda matsuri is held once every two years in odd-numbered years, while festivals held in even-numbered years are on a smaller scale. Performance of traditional noh theatre held outdoors lit only by torchlight. A parade of six intricately carved and lacquered floats, each the work of skilled local craftsmen. These are joined by Iori yatai floats that carry musicians playing folk tunes. Kabuki is performed by children on eight festival floats parading around the town led by children performing lion dances. Features a parade of hundreds of local people dressed as warriors and attendants. Recreating the clan lord's journeys to Edo Castle during the Edo Period (1603-1867). The Aoi (hollyhock) Festival is a solemn and formal parade dating back over 1,000 years, involving 500 people in full Heian Period court dress. An ox drawn cart is led to Kamigamo Shrine from the Imperial Palace (Gosho) where Shinto rituals take place. Sacred dances and music are performed on the way. Known as the world's oldest festival, dating from the mid 6th century. Many events of both a traditional and an international flavour as this is a festival to mark the coming of the kurofune (black ships) led by Commodore Matthew Perry who arrived here in 1854 to demand that Japanese ports be opened to American trade. One of the largest mikoshi parades of all Japanese festivals. A parade of about 100 portable shrines centered on Sensoji Temple. Many geisha as well as others dressed in traditional costumes also take part. Attracts 2 million spectators every year. Citizens' festival featuring parades during the day and in the evening, samba dancing and a fireworks display held out over the harbour. Nikko's most important annual festival, featuring yabusame (horseback archery) and a 1000 strong costumed re-enactment of the delivery of Tokugawa Ieyasu's remains to Nikko. 2-day people's festival packed with events such as mikoshi parades, a flea market, warrior processions, taiko drumming and street dancing. Thrilling traditional festival during which ten teams carrying richly-decorated mikoshi participate in races, ending in a hectic crossing of the Hikosan River in the afternoon of both days. Thirty boats carrying participants in court dress of the Heian Period (794-1192) travel upstream on the Oi River. Leading the way are three boats carrying players performing noh dramas, gagaku musicians and shrine maidens respectively. A group of poets, dressed in ancient ceremonial robes, compose and recite symbolic verses of 17 syllables (haiku). Offerings of any impromptu poem to the deity of Kurumazaki shrine (075 861 0039) will be welcomed. Buddhist ceremonies and performances of court music and dance held before the main event when thousands of specially prepared paper fans are thrown into the crowd. The fans are kept as good luck charms for the coming year. One of the largest festivals in the Hokuriku region. Features a parade of unique festival floats each decorated with ornately decorated, giant effigies of famous samurai warriors. Harbour festival with teams of oarsmen and women competing in longboat races. Also features street parades, dancing and fireworks. A memorial service for the spirit of Masashige Kusunoki, the enshrined deity of Minatogawa Jinja. Many visitors come for the shigin contest (recitation of Chinese-style poems), and for the rice-cake scattering event. Participants wearing costumes and hats which hide their faces wander around downtown Tsuruoka giving out sake to passers by. It's said that if you participate for three years without being recognized then your wishes will come true. Properly known as the Tenjin Festival. Various ceremonies and attractions including sumo wrestlers scattering rice cakes and money, a ritual burning of old paper umbrellas, a children's parade, a warriors parade and a children's sumo wrestling competition. June, Dances of the Six Districts: This is a two day event held at Kyoto Kaikan Hall. All five geisha districts are involved. The grand finale is a dance performed by the combined maiko. Noh performances illuminated by blazing torches with the classic architecture of the Heian Shrine and the Higashiyama hills in the background. The only unreserved seats are the mats and benches at ground level. Annual celebrations marking the opening of Yokohama Port. Festivities include boat races, processions, music, dancing and a marketplace. The festival honors Ryujin, the god of the Tenryu River, and includes kite flying in Hamakita (Hamakita Takoage), a fire-festival parade of a flying dragon's head (Hiryu Himatsuri) and performances of Japanese drums (taiko). The festival celebrates water, sound and flame. Major rice-planting festival that dates back more than 1,700 years. 12 women ritually plant rice seedlings in the shrine's paddy field to the accompaniment of traditional music and rice-planting folk songs. This region is famous for its horses and this festival was originally conceived by horse breeders who wished to pray for long and happy lives for their animals. Features a parade of colourfully dressed horses ridden by local children. Around 80-100 horses usually take part dressed in konida costumes (worn by the horses of daimyo - feudal lords - in the Edo Period). At the end of the parade, prayers are offered for a bountiful rice harvest and thanks are given to the horses. The name of the festival comes from the noise made by the bells (chagu chagu) on the horses' harnesses (umakko) and the event is designated as a national intangible folklore cultural asset. Celebrating the birth of Kukai (aka Kobo Daishi, 774-835), the founder of the Shingon sect of Japanese Buddhism, priests and yamabushi (mountain ascetics) turn out in full regalia for a series of purification rites and an ancient fire ceremony. 'Bamboo-cutting' festival where two teams of monks race to cut four bamboo poles representing evil serpents into three pieces. A festival of folk dance that turns the whole of Sapporo into a stage. In 2000 it attracted 375 teams totalling 38,000 dancers from all over Japan and enough visitors to more than double the population of the city. Dance groups perform in the streets all over the city and stirring music based on the Soranbushi folksong of Hokkaido can be heard on every corner. The most famous of Okinawa's Hare, or dragon boat racing, festivals in which colourfully decorated boats made from lightweight wood are raced by teams of 8-14 men in equally colourful dress. The festival and its associated rituals have a strong connection with the local fishing community who pray for safe sailing and good catches. Held on the 4th day of the 5th month according to the Chinese lunar calendar. Elegant and courtly festival originally held in 1478 to ensure good fortune during the construction of Edo Castle. Features a parade of mikoshi and hundreds of people in the traditional dress of the Imperial court. One of Osakas's three major summer festivals. Celebrates Aizen Myo-oh the greatest of the 8 Buddhist guardian gods and the temple's principle image. Throughout history Aizen Myo-oh has been worshipped by actors, actresses and entertainers as the god of charms and popularity. Hundreds of thousands turn out every year to see the glamorous parade of geisha riding on decorated palanquins called hoekago. The Festival of the Dead, Bommatsuri, takes plase from July 13 to 15. July 1-August 31, Kami Shichiken Beer Garden: this is an outdoor beer garden and an informal event. It is open to all who wish to attend and is a great opportunity to mix and visit with other maiko and geisha - who also dress informally for this event. A music festival organized by the Arion-Edo Foundation. Huge variety of acts and shows all over Tokyo featuring music from many parts of the globe. Runs for the whole month of July. One of Japan's largest Tanabata festivals, annually attracting in excess of 3 million people. Colourful decorations and illuminations brighten up the entire downtown area. Iriya (morning glories) flowers are said to symbolise the beginning of summer and bring good luck. Every year, thousands come to the Kishibojin Temple area to buy morning glory plants from hundreds of street stalls. 'Shiman Rokusen-nichi' means 'day of 46,000' and it is said that a visit to Sensou-ji Temple on these days gets you the credit for visiting on 46,000 normal days. Many thousands of people turn out and hundreds of stalls sell potted hozuki (ground cherry) plants and wind chimes until midnight. Large festival floats are ridden precariously by local men while being towed in vigorous fashion around the Hirano area before being taken back to Kumata Shrine late at night. An exciting spectacle that regularly draws in excess of 300,000 visitors. 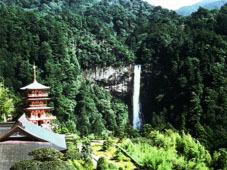 Grand summer festival of Kumano-Nachi Shrine which climaxes with an ancient purification ritual where 12 daitaimatsu (giant torches) of vigorously burning cypress logs are swung by white robed priests as they ascend and descend stone steps at the Nachi Falls - a spectacular 133m high waterfall. Sacred Gion festival of Kushida Shrine in Hakata (the name of the old quarter of Fukuoka) dating back to the 13th century. Prayer ceremonies and festivities begin at the shrine from July 1 and from this date Hakata's famous kazari-yamakasa go on display. These beautifully-crafted floats depict scenes from various historical or legendary tales but at around 16m high, they are too large to be carried. You can see them positioned at various points around the city centre. The highlight is the kakiyamakasa race on the last day of the festival from 5am. At five-minute intervals, teams of happi wearing bearers carrying the smaller but equally extravagant kaki-yamakasa floats race around a 5km circuit to see who can get the best time. The frenzied rush last for about 30 minutes as teams of about 100 take turns carrying the 1-ton float which requires 32 people to carry it at any one time. Spectators throw water on the teams as they pass. Kyoto's Gion festival is one of the most popular festivals in all Japan and features the most lavishly-decorated festival floats. Hoko are wheeled floats up to 25m in length and 12 tons in weight which are pulled with ropes. Some hoko are two stories high and carry people on each level and even on the roof. Yama are smaller and are carried on the shoulders of bearers like mikoshi. Although the festival begins at Yasaka Shrine on the 1st and continues until 31 July with many larger and smaller events taking place, the highlight of the festival is when all 25 yama floats and all 7 hoko parade through the city, watched by many thousands at every turn. The night before the procession crowds gather to see the hoko in downtown Kyoto in a festival called Yoiyama. Summer festival of Yoshida Jinja which culminates in a display of 'pistol fireworks' which are hand-made and then set off by their makers who continue to hold them in position while they spew forth large and spectacular flames over a long period. The bearers wear extra-strong happi coats and douse themselves in water to protect themselves. Shrine festival that incorporates a taiko drumming competition which attracts up to 100 different teams and hundreds of thousands of spectators. Some of the drummers perform atop special floats as they are borne through the streets. A mikoshi parade begins at the shrine at 2.30am and proceeds through the streets of the city towards the beach. Mikoshi from neighbouring shrines join on the way. By the time they reach the beach they can number more than 30. At dawn, around 150,000 people watch them borne into the cleansing waters of the sea as part of a purification ceremony. A group of dancers and drummers, accompanied by flute player and singer, spend all day walking around the town. At numerous locations they stop and perform the Mushi Okuri Odori, an ancient dance asking all the insects to leave the rice fields and go somewhere else. Once common throughout Japan, this dance is rarely performed anymore. A Gion festival modeled on the famous Kyoto Gion Matsuri. Famous for sagimai, an elegant dance performed in a winged costume that represents the graceful courting dance of the heron. Summer shrine festival featuring sagimai, an elegant dance performed in a winged costume that represents the graceful courting dance of the heron. Mt. Osore is believed to be a place where the souls of the dead gather and every year in this period, people climb to the top to speak to the spirits through female shamans who act as mediums. The path to the summit is studded with pinwheels placed by parents praying for departed children. A dragon boat racing festival begun by Chinese residents of Nagasaki in the 17th century. Long wooden boats crewed by a total of 35 people including a drummer and a bailer race on a 4km course in the harbour. Most famous for a parade of 12 highly-decorated dashi floats and the uchiwa or round fans that are given out to festival goers. Gion festival modelled on the world famous Kyoto Gion Matsuri. The highlight is on the evening of the 20th when elaborately decked-out yamakasa floats are whirled round by their bearers to win a competition. Lively atmosphere with festival music and decorative lights. Large areas of Odori Park and surrounding streets are turned into a beer garden with many entertainments and festivities. Attracts hundreds of thousands of visitors every year. A local version of the Kyoto Gion Matsuri. Features Shinto music and dance, taiko drumming and children's kabuki theatre performed on festival floats. A parade of mikoshi led by large ushioni or 'ox-demon' effigies crosses the river followed by hundreds of people carrying torch lights. Other attractions include fireworks and togyu, a kind of non-fatal bull-fighting in which two bulls fight to push each other out of the ring. Also known as ushi-zumo or 'bull sumo'. Commences with a parade of mikoshi and over 600 horsemen in full feudal military dress. The horsemen race each other and take part in various competitions over the three days finishing with the Soma Nomaoi itself in which participants dressed in white, chase wild horses around the shrine compound in order to offer them to the gods. Thousands gather to watch Nichiren Sect Buddhist monks from 120 different temples climb stone steps lined with hundreds of lanterns to the mausoleum of a feudal lord. Dates back to an episode in which a dying head priest ordered that a transcription of the 69,384-character Lotus Sutra in one night. One of Japan's three major festivals. Various festivities on the first day include a procession of danjiri festival floats, drumming performances and a lion dance. On the second day, spectators gather at 4pm and a drum-led procession from Tenmangu Shrine to the Tenjin bridge begins. At 6.30pm the procession continues on the river with 100 decorated boats. Bugaku and kagura are performed on a lantern-lit floating stage in the middle of the river. Brightly decorated boats are towed from the famous torii gate standing in the sea at Itsukushima to the opposite shore. Shinto rituals and classical bugaku dance are performed on board. Dates back more than a thousand years to times when court nobles would enjoy music and dance on boat trips. Unusual festival where the kami (gods) are brought by boat in a portable shrine from an offshore island back to the mainland with accompanying taiko drum music. One of the most popular sea festivals in northern Japan. More than 10,000 take to the streets to dance and numerous paper lanterns decorate the whole city. At Otaru Wharf, some 4,000 paper lanterns are set adrift on the sea and many boats and ships parade around the bay amongst them. Other attractions include mikoshi and fireworks. One of Japans top three river festivals. The highlight is Saturday evening when five straw boats decorated with hundreds of paper lanterns each are set afloat on the Tenno river setting the water glittering with reflected light. A fishermen's festival to pray for good catches at sea. Huge mikoshi (about 20m long) in the shape of tai, or sea bream, are paraded around the town before being taken out to sea. This is the last of the major summer festivals in Osaka and is also known as the 'Minami-matsuri' or 'Oharai'. At its heart are various Shinto purification ceremonies and the festival ends with a mikoshi parade. One of the most colourful and spectacular neputa festivals in the prefecture. Fabulously decorated mikoshi and lantern floats adorned with colourful dioramas parade the streets led by kagura musicians and lion dances. On the second and third days of the festival a traditional polo-like game is played by teams of horsemen at Shinra Shrine. The star of the festival is the giant Ou mikoshi. At 2 tons it is the largest in Japan and it leads a vigorous parade of over 30 mikoshi in total and progresses from the shrine to the downtown area. On the last day of the festival, the bearers carry their mikoshi into the river and immerse themselves up to their necks as part of a purification ceremony. Professional and amateur musicians, dancers and other entertainers perform on stages in Yamashita Park and on floating stages in the bay. One of the largest fireworks displays in all Japan. Said to date back to Edo times (1603-1867) when firework makers would come here to compete to create the most sensational displays. Special annual event of the Church of Perfect Liberty climaxing with one of the world's largest fireworks displays, consisting of over 120,000 shots. Parades include a procession of mikoshi and a procession of 500 people in full samurai armour. Also features a range of bugaku dances, traditional music and taiko drumming. Breathtaking fireworks displays are held on the second and third evenings, regularly attracting over 600,000 people. A folk dance festival that attracts 20,000 participants every year. Teams from local schools, companies and community organisations come up with their own set of movements and parade through the streets to the beat of 5,000 drummers and other musicians. A more low-key version of the Neputa festival held in Aomori but still attracts around 1.5 million people every year. Features parades of huge bamboo and paper lanterns in the shape of fans carried on floats. The lanterns depict popular historical and legendary characters. After the festival, the floats are cast into the sea as a purification rite that is said to rid the town of future illness and bad fortune. Commemorates the reopening of Shimizu port to international trade. Tens of thousands gather to dance in the streets, soak up the atmosphere and enjoy the fireworks display over the bay at Hinode Wharf. City-wide festival bringing the area's three biggest Gion festivals together in one place. A feast of parades, dances and other festivities. A parade of about sixty bamboo and paper lanterns in the shape of historical or legendary heroes. The size of the lanterns ranges from small ones carried by children to 8m tall constructions on festival floats vying to win the competition on the last day. The floats are surrounded by costumed dancers who dance to the sound of flutes and drums. One of the largest festivals in Kanto. It is said that the festival dates back to the 9th century when a local feudal lord used lantern-lit floats to make his forces look bigger. Since then, it has come to be believed that the fearsome faces help to wake sleepy souls in the heat of summer. Known as the loudest festival in Japan. Participants ring bells and hit taiko drums while more than 40 floats parade the city. Big summer event with a lively parade of mikoshi carried by happi-wearing bearers and surrounded by music, dancing and street vendors. The festival closes with one of the biggest fireworks displays in the Kanto area at Karasu-gawa River. Suigo means 'on the water' and this festival holds various events on rivers, canals, lakes and moats all over the city. Includes boat parades, floating theatre, markets and fireworks. Celebrates the history of Oshika as a flourishing whaling port and provides an insight into Japan's ancient whaling culture. Features demonstrations of traditional whaling techniques, whale cuisine and fireworks. A marine spectacular of around 100 floating mikoshi and a fireworks display over the bay. One of Japan's top three port festivals. One of the three major festivals of northern Japan, deriving from the same legend as the Nebuta Matsuri in Aomori in which summer sleepiness must be driven away with lanterns. Kanto are 10m bamboo poles hung with up to 46 lanterns which, in the evenings, young men compete to balance on their shoulders, foreheads, hips and chins. Two torii gates are erected on the lake and ceremonially burned. Thousands of lanterns are also set adrift on the water creating an enchanting scene. More than 10,000 townspeople, all wearing hanagasa, (low-rimmed straw hats adorned with flowers) dance their way through the main streets of the city. One of the largest festivals in the Tohoku region. A solemn ceremony is held on the anniversary of the atom-bombing of Hiroshima in 1945 as a memorial to victims and survivors. In the evening, the park comes alive with music and thousands of paper lanterns are set adrift on the Ota river to pray for world peace. Tanabata festivals are celebrated throughout Japan in July but the Sendai Tanabata Matsuri or 'Star Festival'held in August is Japan's most famous. Bamboo poles decorated with colourful paper streamers adorn the tree-lined avenues of central Sendai. The parades held along Jozenji-dori turn the whole street into a street theatre with music, dancing and mikoshi. Niigata's largest festival. Features a folk dance parade across the Bandai bridge with over 30,000 participants, a procession in full Heian period dress, a mikoshi parade and a fireworks display on the Shinano River. Kyoto's largest open air pottery market. Nearly 500 stalls offering thousands of bargains. The Anjin Festival commemorates the launching of the first western-style Japanese ships built by William Adams (aka Anjin) by sending festival lanterns down the Matsukawa River to float into the sea. There is a ceremony and parade, a concert and taiko drum competition. The main event is the fireworks display over the sea. Loud and lively street festival of traditional music and dancing. A total of 15,000 people divided into over a hundred groups dance in the streets to a local folk song. Every team comes up with its own Bon dance and costume. One of Japan's most famous Bon festivals. Over a million people visit every year to watch and take part in the Awa Odori, a local folk dance set to traditional music. Awa dance is said to be a 'fool's dance'. A well known saying runs, "it's a fool who dances and a fool who watches, so if both are fools, you may as well dance!". The atmosphere is infectious and many thousands dance in the streets, giving the whole city centre a real carnival atmosphere. Noh theatre is performed by firelight as part of a religious ritual. One of the four big festivals on Shikoku. Features parades, shows, one of Western Japan's best fireworks displays (13 August) and a folk dance parade in which thousands of local residents take to the main streets. Major Bon Festival for which many thousands come to watch and dance through the night. Annual fireworks display held over the bay behind the the famous waterborne torii gate in Hiroshima Bay. The largest display in Western Japan. 2,000 stone lanterns and 1,000 bronze hanging lanterns are lit in the evenings at this shrine in Nara Park. Bugaku and Kagura are performed in the apple garden and the dimply lit main hall is open to visitors. Held at the end of the city's bon festival celebrations. A parade of thousands carry floats loaded with countless lanterns to the sea front where they are set afloat on the water. Firecrackers ring through the streets testifying to the influence of Chinese customs in the area. A parade of women wearing yukata and lanterns on their heads perform toro odori (lantern dance) through the main streets. Part of Yamaga City's bon festival celebrations. Shrine festival commemorating a victory of the famous general Minamoto Yoritomo at a garrison nearby over 800 years ago. Features a procession of townspeople dressed in period military dress, folk dance parades, yabusame, and a fireworks display. Access: 10-minute walk from JR Mishima Station. Matsushima's most popular festival is held on the night of August 15, the eve of a service for the dead who have left no surviving relatives at Zuigan-ji. While 8,000 glowing lanterns float out on the water, a breathtaking fireworks illuminates the islands of the bay. The tri-annual Hon-matsuri is one of Tokyo's big three. A large parade of mikoshi processes along a 6km parade route getting sprayed liberally with water every where it goes. The largest fireworks festival in Nagano Prefecture held on the banks of Lake Suwa. 35,000 shot display with a 2km 'Niagara Falls'firework. One of the biggest Bon festival lantern floating events in all of Japan. Over 10,000 paper lanterns are set afloat on the bay with the sky above lit by spectacular fireworks. As part of Kyoto's Bon Festival attractions, a spectacular bonfire is lit near the summit of Mt. Nyoigadake in the shape of the Chinese character 'dai'meaning large. Other characters are also lit on Kyoto's surrounding mountains. Attracts 1,000s of visitors. Bon festival lantern floating event with the scenic Togetsukyo Bridge in the background. Also features traditional music and dancing as well as displays of ukai, the ancient art of cormorant fishing. At night, bonfires are lit near the summit of Mt. Myojogatake to display the kanji (Chinese symbol) for 'dai', meaning large, 108m across. Accompanied by a fireworks display. Held in Hanawa, the old merchant's quarter of what is now Kazuno city. A parade of beautifully carved wooden floats carrying musicians who play Hanawa-bayashi, a kind of folk music dating back to Heian times. A memorial service for graves that no longer have families to look after them. Candles and lanterns are lit for each of the temples 8,000 stone stupas and Buddha Statues. According to legend, a serpent that once terrorised this town was killed by a monk who threw a torch into its mouth. Nowadays, a 30m pillar is erected to symbolise the snake and flaming torches are thrown at it creating a spectacular show of fire and sparks. On the last Saturday of August stalls with food and crafts are set up and you can watch traditional myths re-enacted with kagura music and dance. This event has been held in Ikeda City for over 350 years. In addition to Shinto rituals, 4 metre-long torches are paraded through the city and bonfires in the shape of the kanji (Chinese character) for "dai" (large) and "dai-ichi" (first) are lit on Mt. Satsuki. Japan's most authoritative traditional fireworks competition. High quality shells and creative new designs are exhibited by around 30 expert fireworks producers. Huge paper lanterns painted with colourful designs are lit in the shrine compound. One of Japan's grandest fire festivals, officially marking the end of Mt. Fuji's climbing season. The festival climaxes in the evening when a huge lantern in the shape of Fuji-san is paraded through torchlit streets. Massive bonfires illuminate the mountainside long into the night. Large-scale festival of street dance modelled on the Awa Odori festival on Shikoku. Thousands dance in the streets to rhythmic traditional music and over a million come to watch. At twilight, the mysterious stone Buddha statues of Usuki are illuminated by flickering torchlight. Hugely-popular festival of traditional dance, music and drumming that brings Okinawa's bon festival celebrations to a close. Teams from all over Okinawa compete to be the most colourful, exuberant and stylish dancers at the festival. Held concurrently with the Orion beer festival. Climaxes with a spectacular fireworks display. Traditional bull fighting (bull sumo) in which two bulls lock horns and fight to push each other out of the ring. The bulls do not 'fight' in the Latin sense and no blood is shed. Houses throughout the town are decorated with paper lanterns and hundreds dance the graceful Owara-odori (a form of bon odori) well into the night to the strains of Chinese fiddles. A day of rituals, sumo wrestling and Buddhist dance to petition the gods for mild weather, good harvests and safety in the home. A very distinctive festival at Kamigamo Shrine in which Shinto priests perform rituals in which they hop from side to side, 'cawing' like crows (karasu). These observances are followed by a sumo competition for local boys. Mikoshi, large and small, parade both days to and from Hie Shrine and the Matsuzakaya department store and many entertainments are held at the shrine itself. Tsurugaoka Hachimangu shrines Reitaisai festival features displays of yabusame - Japanese archery on horseback - and draws large crowds. Held every year to pray for a good harvest, this is the largest annual festival held in the garden city of Tono. Shishi-odori (lion dances), Taue-odori (rice-planting dances) and kagura are performed along with yabusame and festival music. Always draws large crowds. Over thirty 4m-tall floats (Mikoshi), carried by their bearers at top speed, rampage around the streets of Kishiwada followed by a stampede of festival-goers, hundreds strong. Not for the faint-hearted but compulsive viewing. One of the most spectacular (and often dangerous) festivals in Japan with hundreds of thousands of people turning up to watch. Tsurugaoka-hachimangu shrine is the spiritual home of yabusame, the ancient art of horseback archery. On the 16th, you can see horsemen dressed in the hunting costumes of feudal times compete in a yabusame competition. Festival showcasing the Hayashi-ke Bugaku, the style of court dance that remains truest to the oldest forms of Japanese dance, showing many influences from as far West as Ancient Greece. The Noto Peninsula's top autumn festival. Mikoshi from 19 shrines in the surrounding area converge on Nakajima and form a day long parade of flag-bearers, musicians and dancers led by a dancing goblin. Festival recreating the march to war of troops who fought in the battle of Boshin no Eki in 1868, a major battle between Imperial and bakufu (shogunate) troops during the Meiji revolution. Features a parade of 700 warriors in full period dress. Dates back 400 years to a time a feudal lord wanted to raise morale after many local people had been sent to war. 3,000 men, young and old, form teams at each end of a 365m rope and pull against each other with thousands of spectators cheering them on. Commercially sponsored festival to promote tourism but fun nonetheless. Foreigners who apply in advance can carry mikoshi through the streets of Ikebukuro. Other events include taiko drumming, folk dancing and a karate demonstration. Celebrating Chinese National Foundation Day in the largest Chinatown in Japan. Lion dances, parades and firecrackers add extra color to the already vibrant streets and a giant 'moon cake' is divided up amongst 300 lucky visitors. The annual grand festival of Nihonmatsu Jinja is the location of one of Japan's three great lantern festivals. 7 large floats bedecked with hundreds of paper lanterns parade through the town to the strains of festival music. Huge 4m dolls representing figures from Japan's historical past are paraded through the city. There is also a similar summer festival held July 16-18. Various traditional dances and a bizarre laughing "warai" festival as the participants laugh in time to the jangle of small bells and commands from a leader. Lively festival with a cosmopolitan atmosphere reflecting Nagasaki's history of international contact. Features parades of colourful floats and unique dances, all with a strong Chinese influence. Regularly attracts over 350,000 visitors. Held every year since 1968, the 100-year anniversary of the Meiji Restoration. Parades, bazaars and bands fill the streets with colour and music but the main attraction has to be the bargain sales held by the major name stores in the district. Demonstrations of yabusame, the ancient Japanese art of horseback archery. Many events and folk entertainments to enjoy but the centrepiece is the tug-of-war involving a rope, 1.5m in diameter, and weighing no less than 27 tons. Hundreds of competitors and many thousands of spectators attend. Held on Midosuji Avenue annually since 1983, this parade has the most varied selection of entertainments out of all Japanese parade festivals. Features music, dance, costumes and tradition not just from Japan but from all over the world. Harvest festival where visitors to the shrines in the area are treated to the local doboroku, a milky-white and slightly sweet home-brewed sake. Sennin Musha Gyoretsu (lit. procession of a thousand warriors) a reenactment in period costume of the 1617 procession accompanying the remains of Tokugawa Ieyasu to Nikko. Decorated portable stages carrying drumming teams are carried by hundreds of other men in this huge taiko drumming competition. 30 teams of 150 compete every year. Two event-filled days honoring the health-giving hot-springs of Shimabara City. Festivities include a beauty pageant, a folk-singing contest, parades and torch-lit Noh performances. Festival of sake-drinking at one of the few shrines in Japan allowed to serve home brewed sake to worshippers. Plenty of unrefined, milky-white sake to go round. Yabusame (horse-back archery) festival performed by young boys. There is a procession of men in samurai costume and dressed as dragons, followed by the archery contest with elaborately dressed and made up young boys. Recreates the splendour of the Edo period. Magnificent floats and mikoshi parade around the old town area before taking part in the hikkawase ceremony in which they are forcefully crashed in to each other. The hon-matsuri (full festival) takes place once every two years. One of the most spectacular parades to be found at any of Japan's autumn festivals. Consists of over 1,700 marchers representing figures from Japanese history in a five-hour long parade. The procession starts from the Imperial Palace at noon and heads west along Marutachi dori, then south on Karasuma to Oike dori, then through Gion and Sanjo dori culminating at Heian Shrine. This is an elaborate parade of people in costumes representing the various eras of Japanese history beginning with the Heian period. The geisha take turns to play the famous beauties of each of the ages (Ono no Komachi, Murasaki Shikibu, Shizuka Gozen) the parade finishes at the Heian Shrine. One of the most "unique" of Japan's autumn festivals. The festival is held in the mountain village of Kurama, north of the city. Participants carry torches and light bonfires throughout the night. Later revelers carry a mikoshi (portable shrine) from Yuki Shrine in Kurama. Festival featuring a unique parade of mikoshi (floats) and dancers led by 100 people dressed as oni (demons) and wearing comical masks. Originally held under the official approval of the Tokugawa Shogunate (1603-1668), the Edo Tenka Matsuri was re-established in 2003 to mark the 400th anniversary of the beginning of the shogunate. Nine mikoshi and 12 floats accompany a large happi-clad procession from Hibiya Park to the Imperial Palace. November, Gion-odori. This is the annual performance of Gion Higashi, which is the smaller of the Gion hanamachi. Famous in Japan for its hikiyama floats. These are carried on the shoulder like ordinary mikoshi (i.e. floats) but are topped with outlandishly decorated fish, lions, samurai helmets and other paraphernalia. They lead a boisterous, saké-fuelled parade around the town. At this, the largest autumn festival in Southern Kyushu, you will be treated to a street parade of no less than 22,000 dancers. Attracts crowds of over 600,000. Men wearing striking masks or dressed as lions, run around the crowded streets looking for children to 'thrash' with bamboo whisks. Legend has it that children 'beaten' in this way will be safe from illness for the coming year. A drumming festival in which 30 neighbourhood teams compete to outplay each other on huge taiko drums mounted on floats. Though still an amateur art after, the rural puppet drama of the Awa region is just as famous in Japan as the puppet puppet drama of Osaka. At this annual event, classic plays are performed on an outdoor stage. A parade of thousands of people dressed as heroes and historical figures takes to the streets of Osaka. Colourful boat-shaped floats join the procession and add to the magnificent spectacle. A parade of 150 in full period-dress recreating the crossings that the daimyo (feudal lords) had to make in order to present themselves to the Shogun during the Edo-period (1603-1867). Kagura dances, thundering taiko drums and bonfires celebrating the time when the gods landed on the earth at a site nearby. Fire festival anticipating the coming of winter. 30 massive torches, each 10m tall and 3 tons in weight, are lit and paraded to the rhythms of taiko drums. The festival recreates the atmosphere of the Heian court when the Emperor and his court leisurely cruised the Oi River in Kyoto. Five period-decorated boats filled with people in Heian costume, playing traditional instruments and reciting noh and kyogen begin the water parade followed by a larger flotilla of similar vessels. December, Kaomise: The flower and willow world reviews the next years cast of kabuki characters as they present themselves. The maiko and geisha go all-out to be the most splendid of them all. In this 400-year-old festival, oshiroi, a white paste made from rice flour and water, is smeared on villagers' faces as a prayer for good harvests in the coming year. Famous night festival in which lantern-lit floats weighing more than 10-tons each are pulled through the town. Village youths carry food and torches in procession to offer to the gods for peace and good harvests. Historical festival in which large brightly-coloured flags are carried in a procession through rice paddies and mountain paths accompanied by conch-blowers. Mountain Priests offer thanks for water and fire by lighting fires, giving demonstrations of their axe, sword and archery skills and offering rice cakes to visitors. Priests walk over burning embers in a purification rite at Fukugon Temple. Traditional dances and warrior parades as an annual memorial to the legendary '47 ronin' (wandering samurai) who commited suicide to avenge their master. A procession commemorating the 47 Ronin with people in traditional costume walking from Bishamon Temple to Oishi jinja in eastern Kyoto. Countless stalls and shoppers crowd the streets at this flea market that dates back to 1578. A huge range of items to browse and buy including antiques, second-hand goods and food. Priests dressed in white and impersonating tengu goblins are cursed and abused. Participants attempt to steal the goblins' offerings, while the goblins attempt to ward off their abusers with bamboo staves. A chance to see rarely performed traditional dances at a festival that has been observed every year since it began in 1136. A two-hour procession (owatarishiki) through central Nara begins at noon from the Prefectural Office followed by around seven hours of dances. This temple has been holding daruma (a manifestation of the Buddha) fairs for every year over 400. Attracts large crowds. An ancient folk tradition still observed in villages all over the peninsula in which young men dressed in frightening namahage costumes visit the homes of children to warn them not to be lazy in the coming year. A famous fire festival in which two giant chiggers are set alight and pulled about with ropes. Held in remembrance of those who died during the second world war. Participants light torches from a sacred flame (hi) and then pray for peace as the bell (kané) announces the beginning of the New Year. Research a festival of your choice and state in the forum which festive you will work on. Write about the festival in a notecard that you will give to your oneesan, mentor or Okaasan. Do NOT copy word for word from your research source but summarize in your own words. Hold a festival for Amatsu Okiya. You must do this assignment before you can move on to the next lesson. Do not make your "festival" event run longer than 2 hours- although if you wish you may do two in order to incorporate European and North American "times". PLEASE DO NOT PURCHASE ANYTHING FOR THE FESTIVAL. CHECK WITH YOUR ONEESAN OR OKAASAN. USUALLY WE CAN MAKE THINGS OURSELVES OR NEGOTIATE PRICES THROUGH OUR BUSINESS CONTACTS.